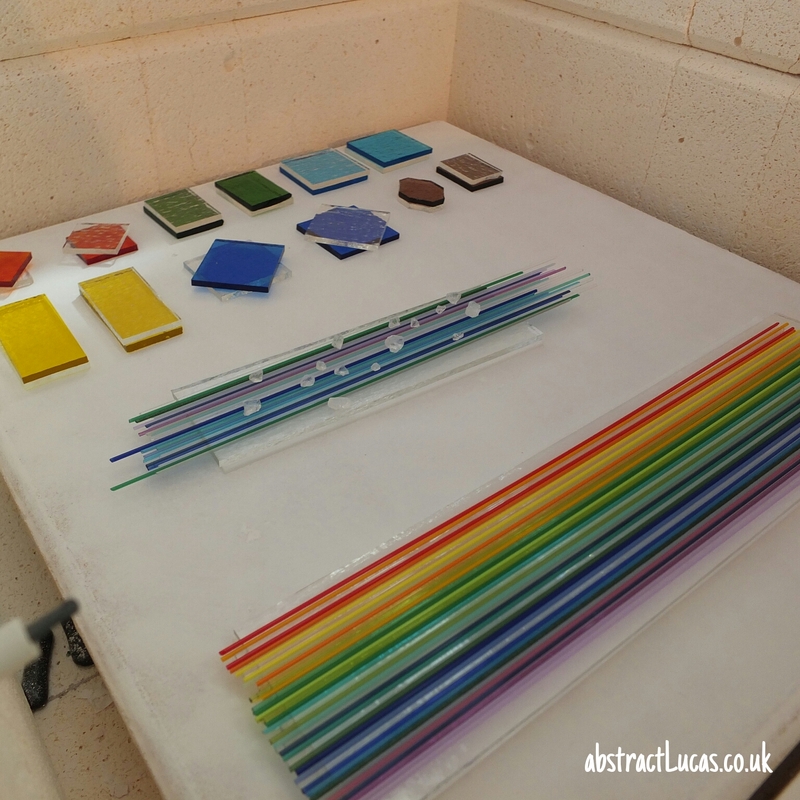 Having got hold of a range of sized and shaped pendant tray frames, the next step in the process of developing these pendants is working out how to shape and fuse the glass to fit them (then called cabachons, or cabs), and how doing this differently will create a variety of effects. The best way to do this is to experiment, but I am not a patient person, so I want to do this in the least separate firings that I can. The only way to do that, however, is to be organised - another virtue I'm seriously lacking, so I'll just have to see how it goes. 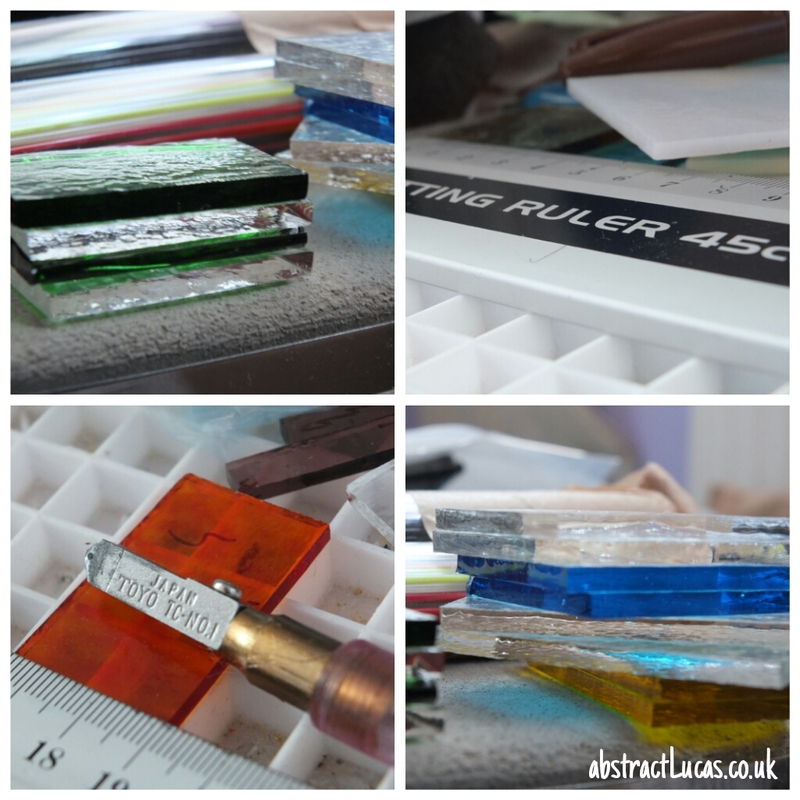 The square and rectangular pieces should be the easiest to shape, but measuring, cutting and breaking the glass will all need to be done really carefully. I'm going to start with two layers of 3mm bullseye glass, cut to the measurements I've taken of the interior dimensions of the frames. The more accurately the pieces are cut the better they should fit the frames, and the easier it will be to replicate for future pendants. This means I'll have lay ups of 25mm by 50mm for the larger rectangle (yellow), 25mm by 35mm (green) for the other, and 35mm square for the square (turquoise), logically enough. 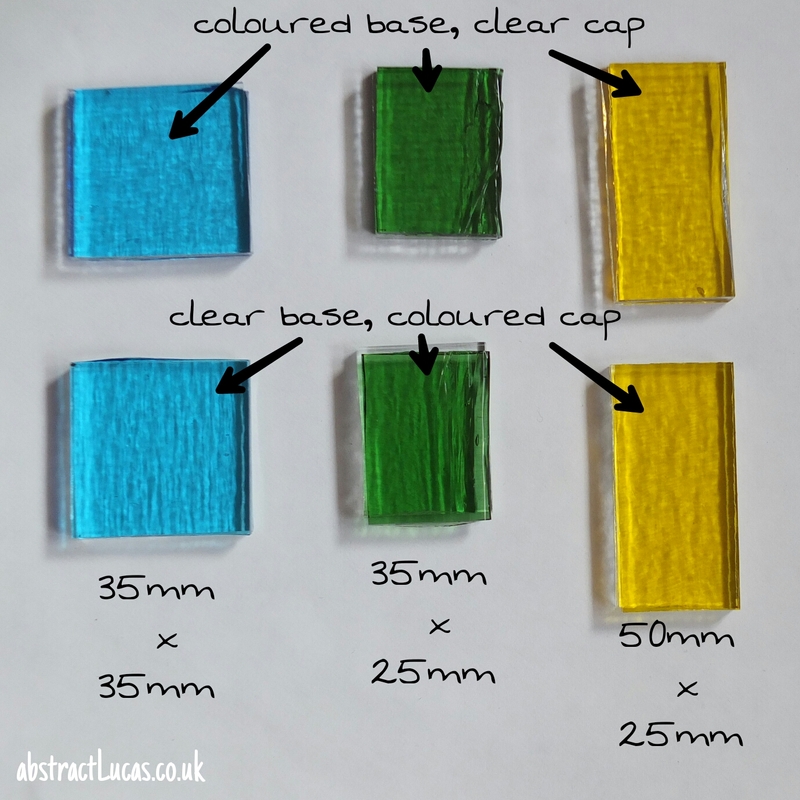 As you can see, I've positioned two versions for each size - one with a coloured base (bottom layer)and clear cap (top layer), the other with a clear base and coloured cap. 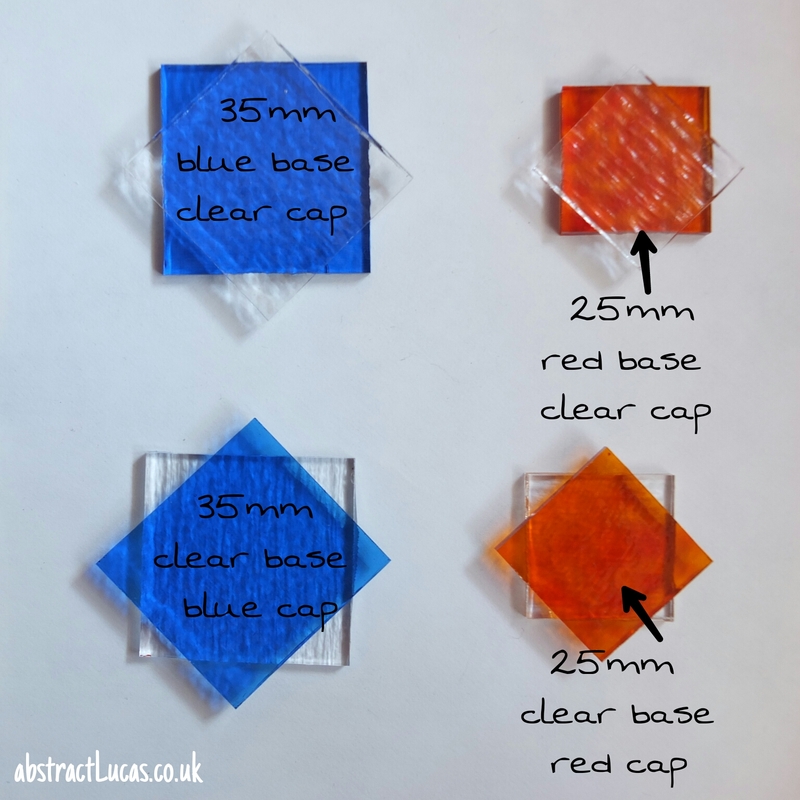 This is just so I can decide whether one way looks better than the other - but when I'm making them properly I will probably use opalescent (opaque) glass for the bases so you don't see the base tray and glue through it. Rather than trying to cut teeny tiny circles for the circular frame I'm going to try using two squares cut to the diameter of the circles, and lay them on top of each other, but not lined up - off by 90° instead. Hopefully this will fuse to a circular shape! The bigger circular frame has an internal diameter of 35mm (blue), the smaller 25mm (red), and again one of each size has a clear top layer and the other has a clear base. By using two different glasses I hope I'll be able to see which glass melts to where exactly, so I'll know whether I'll be able to use an opal base with a clear cap and still end up with a circle. If these don't end up circular, I'll do an experimental run with squares with the corners nipped off, to see if these end up a more even shape. 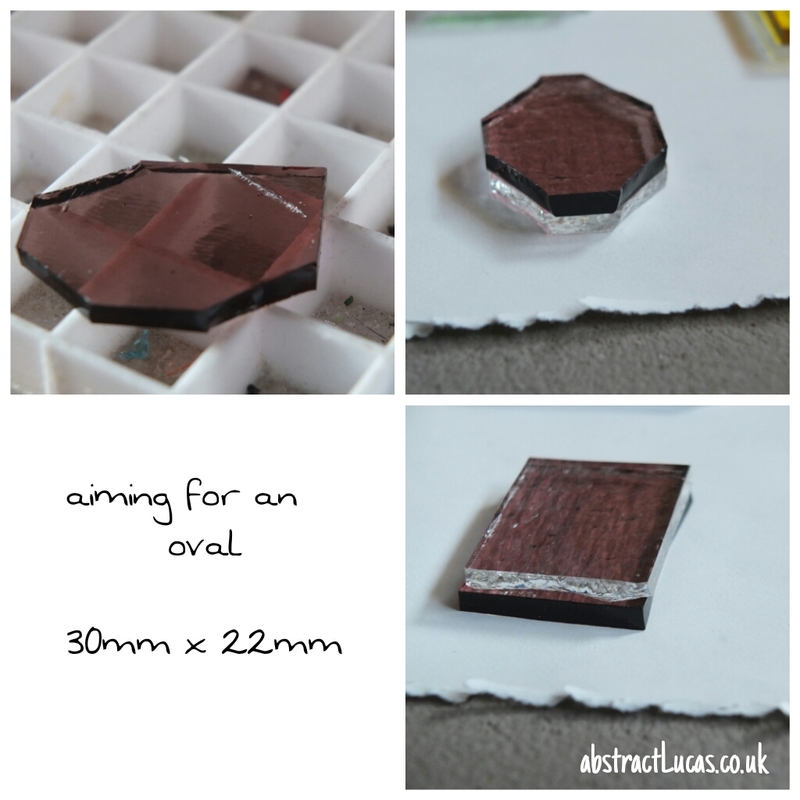 I don't have any experience of making oval pieces so not sure what might be the best approach, but in my mind the oval is kind of a lovechild of the circle and the rectangle, so I'm going to try treating it as such, and merge the approaches I'm using for them. If I cut the length of the glass pieces to match the longest measurement from inside the frame - 30mm - and the width to match the widest point - 22mm - and then nip off the corners of this rectangle at an angle. Fingers crossed when the glass rounds off it'll give me a gentle curve! Trying to fuse individual pieces to fit the frames is one idea, the other method I want to try is fusing an art piece and then slicing it up into pieces that will fit. Because that will leave sharp edges it will need another session in the kiln to soften the edges, to blunt them, but I might also try grinding the edges off of some and then firepolishing (cooking again for a shorter amount of time to make the surface glossy) so the edges are defined but not sharp. 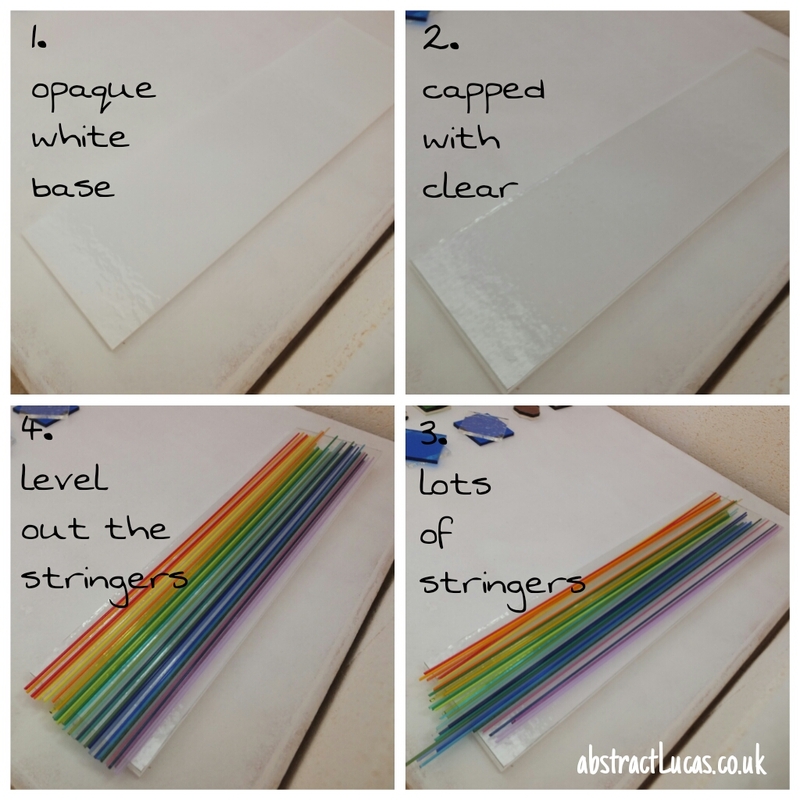 The first stage of this is creating the piece to cut up, and my favourite way to do this is to use stringers - thin strands of coloured glass. To get a big enough piece to cut up later, the white base is 25cm by 6cm. Stringers are usually 45 cm long, so I snapped them in two to get approximately the right length, but this doesn't need to be exact as I'll be cutting the piece I end up with anyway. As well as this rough rainbow piece, I've also put together one with some of the discarded ends of stringers that are blue and green shades, and added some frit on the top. 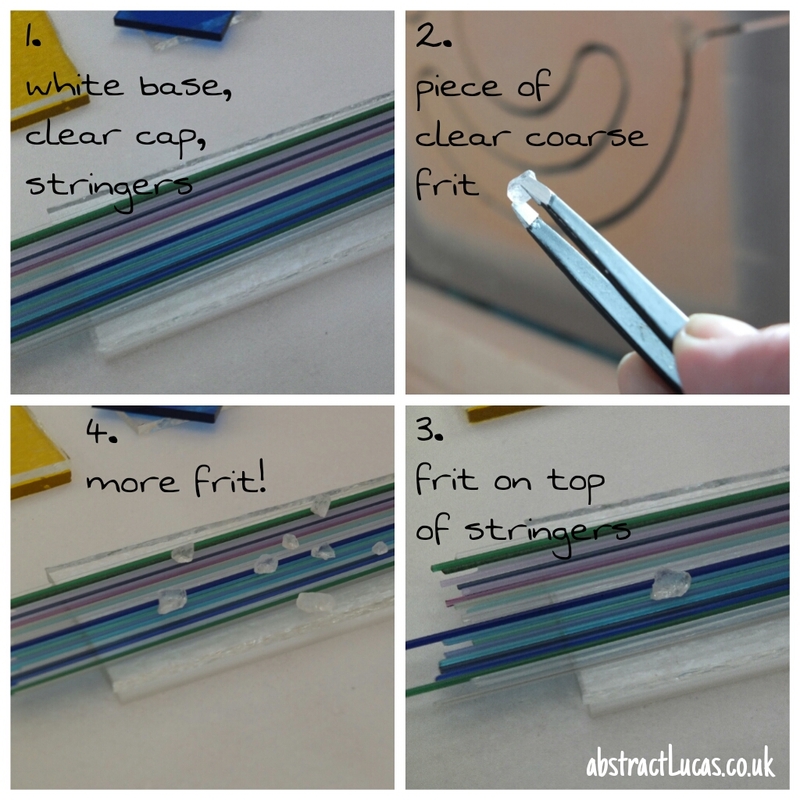 Frit is chunks of glass, available in different grades (coarse, medium, fine, powder) and different colours. I used clear coarse frit, which I'm hoping will add some extra interest by creating tiny clear pools in the stringers once fully fused. I'll start a full fuse programme in the morning - watch this space!